It feels––it smells––like October right now. Fall is still here, but it’s a bit windier, a bit brisker, and my CSA now contains squash and kale instead of heirloom tomatoes. For the last few weeks, my housemates and I have had a verifiable harvest of different squashes on our kitchen table––them waiting to be eaten, us waiting for it to be cool enough to do so. Well, it’s time. 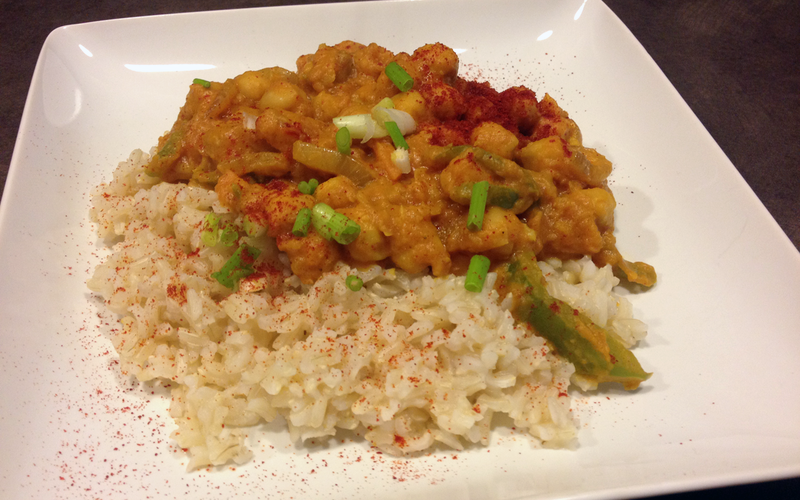 In London last semester, my flatmate Sophie used to make a chickpea korma curry that was simple enough to throw together after a long day filled with lecture, tutorial, and commute but also comforting enough to make you want to fall right asleep after. This recipe is an ode to that, but with a ton of local vegetables instead of whatever was on sale at Sainsbury that day. It’s a wild combination of roasted acorn squash, chickpeas, spices, and tahini. It’s also vegan––and you’d never even know. * If you cannot find Peruvian chili paste, which has an incredible smokey and complex berry-like flavor, substitute with sriracha or another hot sauce. It won’t taste the same, but it’ll at least give a bit of heat to the dish. Preheat the oven to 450º. Halve an acorn squash and remove its seeds and pith. 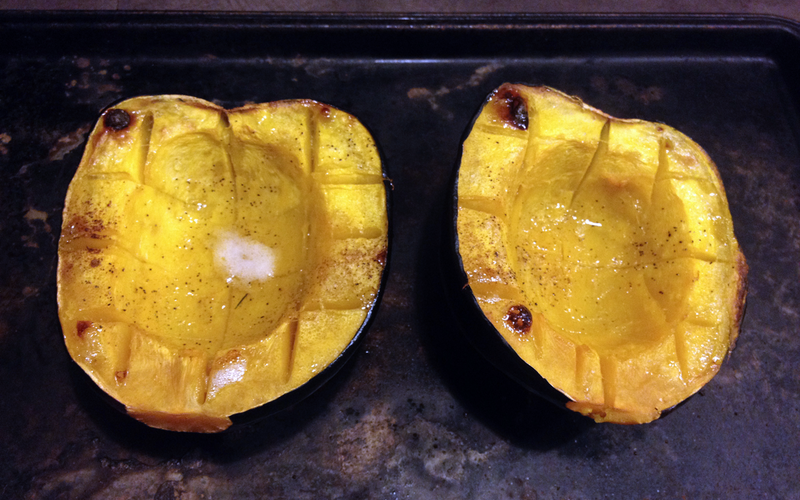 Score the inside of the squash with a cross-hatch pattern, drizzle with olive oil, salt, and pepper, and place cut-side-up on a high-rimmed pan. Pour a bit of water in the bottom of the pan so that the outside of the squash doesn’t burn, and place in the oven for 30-40 minutes until tender and cooked through. Let cool, and then scoop out the squash from its shell. Cut into large chunks. Place a large sauté pan over medium heat with the olive oil, onions, and peppers. Salt to taste, and let sweat until the onions are translucent and mostly cooked––about 5-10 minutes. 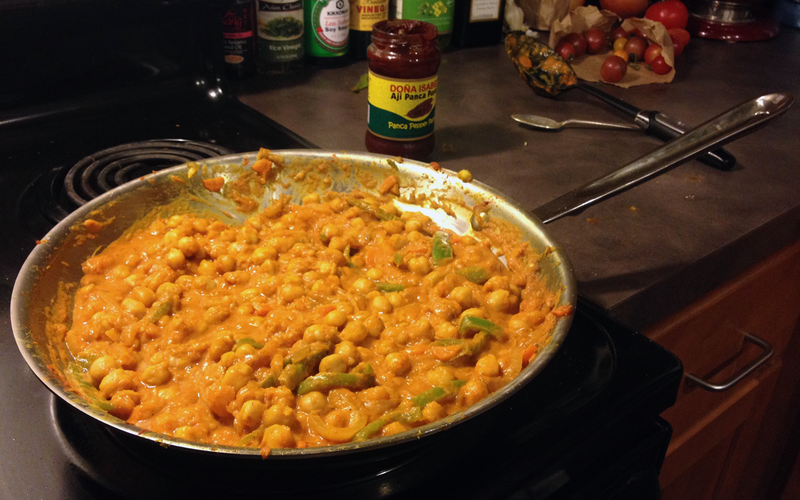 Splash some rice wine vinegar in the pan to deglaze the bottom, and then pour in the chickpeas, curry powder, and Peruvian chili paste. Stirring occasionally, let cook for 2-3 minutes. Stir in the diced squash. Add the vegetable stock and tahini to the pan and stir. At this point the curry should be rich and thick with just enough liquid to keep the dish viscous. Taste for seasoning: it might need more salt, more curry powder, even a bit of red chili flake or cayenne for spice. 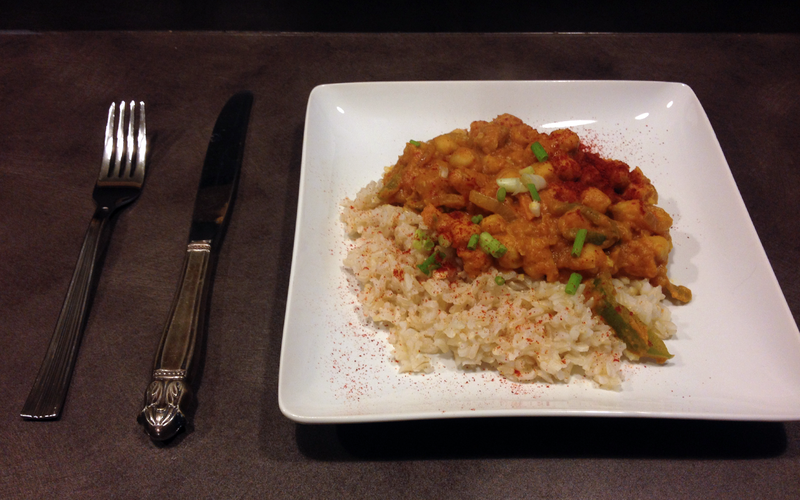 Serve the finished curry over brown rice or quinoa, and garnish with some sliced scallions and a dusting of smoked paprika. Enjoy.